Angelina Jolie Shows Off Her Blingy Engagement Rock!! A glowing Angelina Jolie was all smiles as she stepped out of the Roosevelt Hotel in Los Angeles showing off her new 16-carat diamond engagement ring. The “Changeling” actress was all smiles and radiant as she waved to cameras looking very thrilled about her engagement to mega-star and longtime beau, Brad Pitt. Rumors are flying regarding the Jolie-Pitt wedding, which is being compared to the Royal engagement held in 2011. The largest betting company in Europe, Ireland’s Paddy Power, gave Versace 5-2 odds that the 36-year-old actress would choose the designer for her wedding dress. Other hopefuls include Max Azria, Giorgio Armani, Elie Saab and British brand Amanda Wakeley. Well Americans are as sweet as they are weird,lol. Betting over whose designer brand a celebrity couple gets to wear!! Well this is what you get when you raise a dead man to perform live. A re-animated ‘hologram’ performance of Tupac at Coachella have raised fresh controversies surrounding the rap icon’s death. Black Kapital Records Founder and CEO Suge Knight, 47 recently appeared on 93.5 KDay in L.A. with Tattoo and Cee Cee on Friday Morning (April 20). These and many more controversies have being raised continually since he passed on 15 years ago. Tupac was riding in a car with Suge Knight when their convoy was attacked in a drive and stop shooting carried out by unknown men who have yet to be arrested till this day. 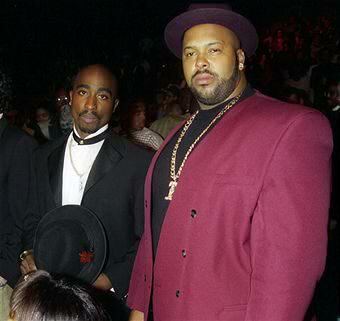 During the attack Suge was shot in the head while Tupac was shot a rumored 4-7 times at close range. After Tupac was pulled out of the car his bodyguards explaining what happened said; Tupac complained of not being able to breathe,then he took one deep breath and gave up the ghost. There is also another version where it was said Tupac was taken to the hospital in an ambulance. Many argue that his death was orchestrated and argues further that if you listen to the lyrics of his songs he actually predicted his death in most of them. There is another version of the story that says after he was taken to the hospital his doctors confirmed that he would survive the injuries but six days later the world was shocked to hear of his death. Soon after his death, his latest album at the time, 7 day theory was released which he blows out many lyrics that referenced the days leading up to his “death.” Tupac often spoke on being resurrected and coming back to surprise his enemies. Tupac is said to have had a life insurance in the event he died. His mother, Afeni Shakur reportedly have not collected the money to this date. Why ? Is it because she knows her son, Tupac is not dead and collecting life insurance from a person who is not dead is fraud. What are your thoughts?Do you think Tupac is actually alive and hiding somewhere? 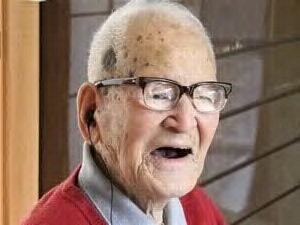 Happy Birthday to the world’s oldest man, who turned 115 on Thursday! Japan’s Jirouemon Kimura lives in the western city of Kyotango and celebrated at home. Although he’s not able to move around much these days, spending most of his time in bed, he always makes it a point to eat three meals with this family on a daily basis, Timeslive.com reports. Kimura’s birthday is April 19, 1897, and he has seven children, five of them who are currently living. With that being said, Kimura has 14 grandchildren, 25 great-grandchildren and 13 great-great-grandchildren. The world’s oldest man worked up until he was 90, and endured a 38-long career at a local post office. When he retired from the post office, he farmed. The Daily Mail reports that Kimura said “It is a great honour, and words alone cannot describe my feelings,” that he’s the world’s oldest man, after the former record holder passed away last week. “I take it as a sign from heaven and am deeply moved,” he said. Kimura said one of his secrets is that he doesn’t eat to where he is full, stopping when he’s around 80 percent full. The world’s oldest person is reportedly Besse Cooper, whose birthday is on August 26, 1896.